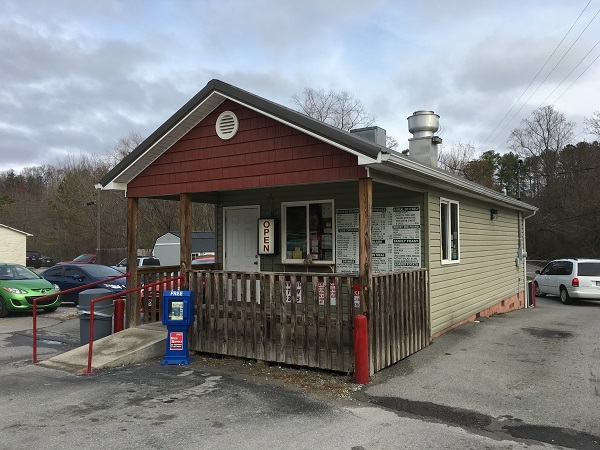 Spencer B’s BBQ, Ringgold GA – Marie, Let's Eat! I’ve been down on eastern Tennessee barbecue and quick to praise the much better meals that I’ve been able to find all over Georgia. But what about the places just a few minutes’ drive from Chattanooga? Is the state line really all that great a barrier? Last summer, on one of our many (many) drives ferrying clothes and books from our old digs in Marietta up here, the GPS told us to get off I-75 and use a different route to get around traffic. This took us past Spencer B’s, a little drive-through and carry-out shack on US-41 and Marie said there was another place for me to try. But I wasn’t in a really big hurry; I wanted to try more places with a Tennessee ZIP code. But months of malaise later, I started to wonder. Is it really just the state line that makes a difference, or is it really more of a “sphere of influence” thing? I looked around at places in northwest Georgia that I’ve tried over the years. I remembered that Bailey’s, which is also in Ringgold, has a flavor profile very similar to what I’ve been finding everywhere around Chattanooga. Some do it better than others, and most places are pretty good, but there’s not a lot of variety to be found. A couple of weeks after I visited Spencer B’s, we had dinner in Atlanta with our pal Speedy, one of the Barbecue Bros, at the fantastic B’s Cracklin’ Barbecue, a place so darn good that after our first meal there, I was ready for a second above all the other local options. (Here’s Speedy’s story.) I suggested that a big reason I’ve been so disappointed with the options around Chattanooga is that barbecue in Georgia can be so radically different everywhere and anywhere you go that it’s impossible to get bored, and incredibly difficult to predict what any new place will be like. The flavor profiles, the sauces, the techniques, these can all vary spectacularly in the same small town. But I was supposed to be telling you about Spencer B’s. 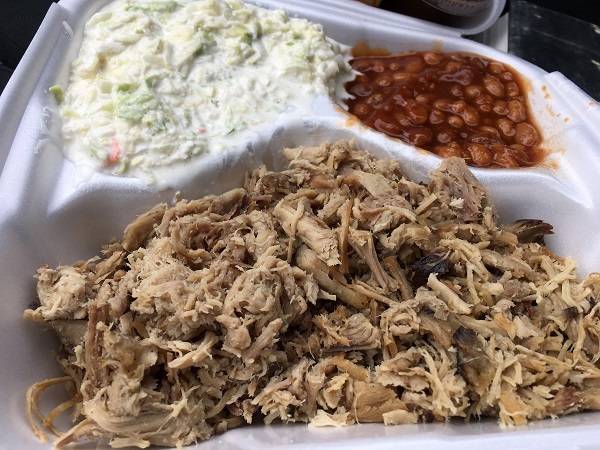 Like most of the barbecue around here, it’s pretty good, and I wouldn’t say no to another visit at all. It’s also quite pleasantly cheaper than the $10 average for a plate with two sides that you usually see around Chattanooga. This was only seven dollars and they give you a heaping pile of chopped pork. The slaw is unfortunately that variety that I call “mayonnaise soup,” but the pork’s good enough that it doesn’t matter. They smoke over hickory and chop it into quite small pieces. It’s smoky and dry and needs a little sauce, and the one that they have available is a thick, sweet, sticky brown sauce. Again, it’s pretty good. If somebody suggested meeting up here, I wouldn’t say no. They do nothing wrong, except possibly the slaw, But I think I’ve written most of the previous paragraph a dozen times in the last eight months. I’m ready for surprises. Posted on February 3, 2017 by Grant G.Posted in barbecue, chattanooga, dalton, georgia, tennesseeTagged barbecue, chattanooga, dalton, georgia, ringgold, tennessee.